Yes. We are fully trained in carpet & upholstery cleaning by the highly recognised National Carpet Cleaners Association (NCCA). Additionally we are trained by LTT Leathercare in leather cleaning and by Prochem UK in hard floor cleaning. We are comprehensively insured for third part liability, accidental damage to your property, treatment risk and loss of clients keys. A copy of our up to date insurance details are available upon request in PDF format. Can I be confident that I will be happy with your work? See what our clients have to say on the testimonial page. I have stains on my carpet. Is there anything you can do about them? We use hot water extraction (HWE), sometimes incorrectly referred to as steam cleaning. Our type of system is endorsed by Shaw Industries the worlds largest carpet manufacturer who advocate the use of equipment that has a superior level of performance and power so as not to over-wet the carpet. What Shaw Industries say: Research indicates that the hot water extraction system provides the best capability for cleaning. 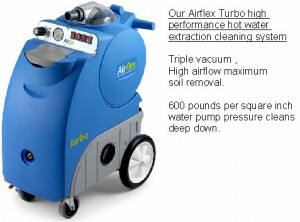 This system is commonly referred to as “steam cleaning”. although no steam is actually generated. The process consists of applying a cleaning agent into the carpet pile and using water in the extractor to recover the used solution and soil. Dark marks keep appearing on my carpet after I have cleaned up spills.. how is that? When a spill occurs on a carpet such as a soft drink or food, remedial action is taken to remove the stain and all looks well for a while until a dark mark re-appears. This occurs because the sticky sugar or oil residue from the spillage has not been completely removed and perhaps over a few days or weeks the area begins to turn dark. The dark mark gradually appears because the residue from the spill attracts dirt from foot traffic. Additionally, if a stain removal product was used such as 1001 or Vanish, this may also leave a sticky residue which further attracts soil resulting in the treated area turning dark over a period of time. The only way to remedy this, is to use an extraction machine which in most cases will remove the residue and prevent re-soiling. Will cleaning reduce the life of my carpet? No, just the opposite. This system removes the grit and soil which is walked in and settles deep within the pile. This soil cuts and frays the fibres, reducing the life of carpet through frictional wear. Regular cleaning will not only extend carpet life by years but will also maintain a healthy environment! Shaw Industries, the worlds leading carpet manufacturer says;Get on a cleaning schedule: If carpet is cleaned before it becomes too unsightly, the cleaning chore will be easier and more successful. Carpet in a typical household should be cleaned every 12 to 18 months, depending on the number of residents and amount of activity. Choosing the proper cleaning system is important. Some systems may leave residues which accelerate re-soiling and defeats the whole purpose of cleaning. Is your cleaning system safe for my children and pets? Carpet cleaning methods will vary from one company to another. Hot water extraction is recognised by professionals as the most efficient deep cleaning method available. Some companies utilise detergents within the machine which can leave sticky residues in the carpet; therefore possibly causing premature re-soiling. Not only is considered poor practice but also not environmentally friendly towards children who may be crawling and also animals. The cleaning products we use for domestic use are classified as ”food grade quality”. The cleaning product is first applied to the carpet and is then usually agitated with a rotary scrubbing machine which dislodges soil and stains (as seen on the carpet cleaning page). We then use hot water extraction with fresh water and zero detergents to complete the cleaning process which completely removes any cleaning products. Therefore the carpet is left in a completely natural state with no residues that could affect children’s skin or pets. Carpets are left lightly damp and ready to use, as most of the water used to clean them is recovered back into the machine. Depending on the type of carpet, humidity and time of year, drying can take between a few hours and over-night to be touch dry. Do I need to remove everything from the room? No, but it does help if any breakable items (i.e. China, glassware etc.) are removed from the room, including those inside cabinets that will have to be moved. It would also help if small items of furniture are also removed, such as waste paper bins, paper racks etc. We can then move furniture, clean and put the back in position placing protector pads beneath the item to prevent staining from unstable furniture dye or rust marks from metal furniture. Will my carpets re-soil quicker once they have been cleaned? No, there are several reasons for rapid re-soiling. Firstly, low powered non-professional machines over-wet the carpet and are inefficient at recovering the water. This leads to the carpet taking several days to dry, over which time the un-recovered soil wicks up to the surface. Secondly, some types of detergents can leave a slightly sticky residue when dry which then begins to pick up soil from shoes, therefore causing re-soiling even after as little as a week. We are called out to the above situation many times and this can usually be remedied with our system. Our cleaning products which are ”non detergent” are removed into the machine with clean water, so the carpet is left with zero residues and in a natural clean state. I have dark marks around the edge of my carpet and under the doorway. Can you remove them? 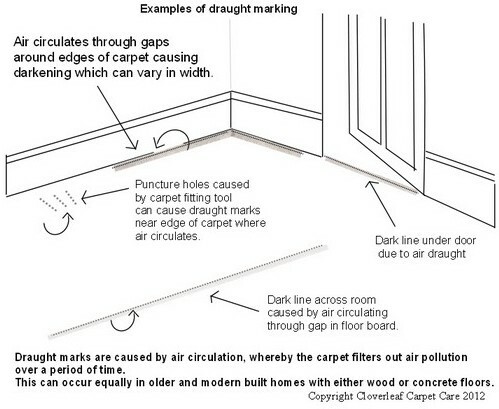 These marks are usually referred to as filtration soiling or draught marks which are caused by pollutants in the air circulating around the edges or under doorways. These can sometimes be found in more acute situations across a room and following the line of floorboards. This type of marking can be difficult or impossible to remove, however in some situations they will respond to cleaning quite easily. I have what looks like shading running across the walk-ways on my carpet... is there anything you can do? 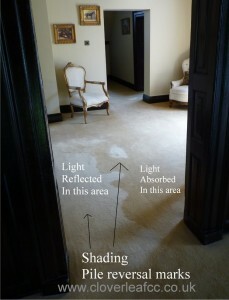 Shading or pile reversal as it is sometimes referred to, is when the pile of the carpet is lying in different directions, therefore reflecting the light differently at different angles of view. There is nothing that can be done to remedy this.This can also occur in heavy wear areas such as in front of a sofa; the wear causing the pile to lie in a different direction. For more information on pile reversal, click here carpet pile reversal to open a PDF document. Can you remove odours from carpet? Most carpet odours are related to vomit, pet urine and musty smells. Vomit odour is usually caused by children and baby accidents. In most cases these can be removed by diluting bicarbonate of soda powder (baking soda) in to warm water and spraying the affected area, allowed to dwell for 10 minutes and blotted with kitchen towel. Musty smelling carpet is usually attributed to the carpet being exposed to moisture. This can be caused by several things including flooding, a water leak or where the carpet or rug has been stored in an out building. It can also be caused by using inefficient carpet cleaning equipment whereby the carpet has been left over-wet. The odour is caused by bacteria growth. In most circumstances, especially where it is a fitted carpet, the carpet including the underlay will need replacing. It is also advisable to clean the sub floor with a solution of bleach to eradicate any bacteria. Pet urine odour in carpets is a common problem caused by puppies, elderly dogs, cats or just untrained pets. In most cases it is impossible to remove the odour where it has penetrated into the backing and also the underlay and sub floor. Usually the only remedy is to replace the carpet and underlay and clean the sub floor with a bleach solution. There are many companies that profess to be able to remove urine odour and also many off the shelf products which make similar claims which you should be wary of. Additionally, you should be careful of applying ”off the shelf” pet stain and odour removal products to carpets without testing first in an inconspicuous area as we have seen many carpets that have been ruined by bleaching. 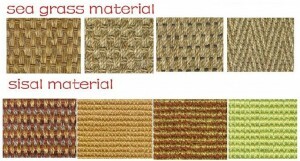 Do you clean sisal, sea-grass, jute and coir carpets? This type of carpet cannot be wet cleaned as it will almost certainly shrink. A low moisture cleaning method is the only way to clean this type of carpet; however the results more than likely will have little effect on heavy soiling or stains. Therefore many companies will be reluctant or may refuse to clean them. Regular vacuum cleaning with a good upright vacuum cleaner is the best way to keep this type of carpet maintained. Altrincham | Crewe & Nantwich | Hale | Holmes Chapel | Knutsford | Lymm | Middlewich | Northwich | Sandbach | Tarporley | Winsford | Wilmslow and Alderley Edge. Carpet cleaning prices will differ form one carpet cleaning company to another and quite often the results achieved by different companies can vary significantly. Pricing is usually worked out by the size of the room, however no two jobs are the same. The common mistake many people make, is to call several companies for the cheapest possible quote and wrongly assume that they are getting the best job possible. Many problems arise from lowest-bid companies. These companies are usually geared up to give the cheapest price possible by way of employing inexperienced employees and investing in low cost, low powered equipment or even, Do It Yourself Carpet Cleaners just to obtain the volume of work without regard for quality or professional results; therefore leaving a disappointed customer with half cleaned, or over-wet carpets/furniture which could and does result in permanent damage without the company taking responsibility . Similarly, many of these companies are responsible for the cut price cleaning leaflets or internet deals that often display a non geographic phone number and advertise nationally. We have invested many thousands of pounds in the latest ”state of the art equipment” and training, along-side more than ten years of experience. This means you can be confident with first class professional results that cannot be beaten. Our prices are not the cheapest nor the most expensive, therefore the quote you get from us will certainly be value for money without franchise costs or VAT. The majority of our work comes from recommendation and repeat business, so we must have it right! See some of the results that can be achieved in the gallery here Additionally if you have an unfurnished property, please read more here about the substantial discounts available.